Arsenal have almost £200m in the bank after making an increased profit of £25m last year, the Premier League club's latest accounts have revealed. The figures, covering the year ending 31 May 2015, show the Gunners spent a record £114m on new players. 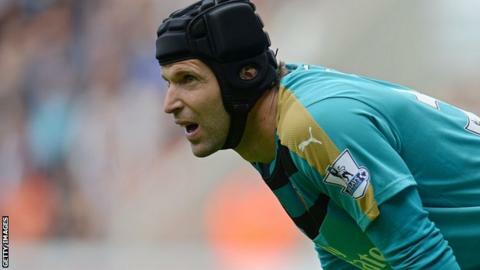 But they have been criticised by some fans for only making one signing - keeper Petr Cech - over the summer. "We're focused on delivering more success," said Arsenal chief executive Ivan Gazidis. The cash reserves of £193.1m are intended to cover costs for a full season and are not solely designated for player transfers. However, the Arsenal Independent Supporters' Association insists the strong financial figures must be matched by positive results on the pitch. Arsene Wenger's team lost 2-1 at Dinamo Zagreb in their Champions League opener on Wednesday. "The financial figures will only add fuel to the fire for those calling for further squad investment," said AISA chair Lois Langton. Profit before tax was £24.7m, up from £4.7m in 2014, while the north London club say they have no short-term debt. Total turnover was £344.5m - an increase of £42.6m from the previous year, boosted by a new kit partnership with Puma. "We continue to look to develop every aspect of our operations while remaining true to our principles around being self-funding, investing in youth, our style of play and our commitment to our fans and to our place in the community," added Gazidis.